As one of the longest established removal companies in Tenerife and the Canary Islands, we can offer a full range of professional removal and storage services to suit your every need. Let us know about your move and we will arrange a home survey to work out your exact quote. First established as Union Jack Removals, Worldwide Moving & Storage changed name to reflect our ever growing expansion and services around the world. Worldwide Moving & Storage are also the ONLY removal and storage company in Tenerife or the Canary Islands who is an overseas associate member of the British Association of Removers (BAR). 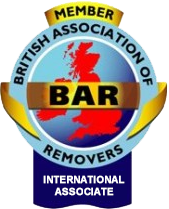 BAR represent over 500 of the leading removal and storage companies in the UK and Go Worldwide Moving and Storage are pleased to be ranked among them. We are proud to be associated with such companies as the Isaac Newton Group (formerly the Royal Greenwich Observatory), for whom we transport personal effects and specialist instruments to all parts of the world. We cater for clients on all 7 of the Canary Islands, but our main facilities are based on Tenerife where we have two storage depots to accommodate clients in the North and South. Through our extensive experience of importing and exporting to and from Tenerife and the Canary Islands, we are consigned work from associate removal companies all over the world from as faraway as Malaysia, The Seychelles, Thailand, New Zealand, Australia, Europe, Hawaii through to the USA, southern America (and of course the UK!). Please feel free to take a look through our range of services - we are sure they will meet your needs, and exceed them!